Eurostile™ is an amazing font that has been with designers and users for many decades now. The font is the apple of everyone’s eyes. Novarese and Butti during the early 1950s made Microgramma famous. Microgramma was available with a huge variety of weights and widths. This enhanced its immediate popularity. However, the problem was that the original version of Microgramma comprised of only caps. 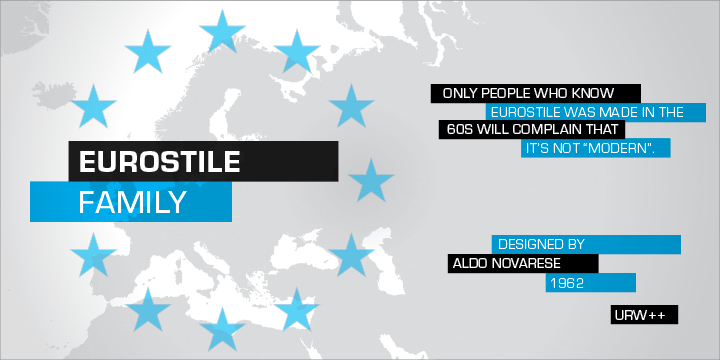 Hence, a decade later, Aldo Novarese came up with a beautiful design known as Eurostile via adding a lower-case alphabet and some additional weights, such as Compact.